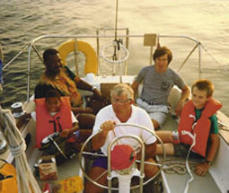 SAIL USA is an organization formed by a group of educators in the early 1980's that offers alternative opportunities to inner city and special needs children. These alternatives consist of sailing, power boating, and other recreational activities. We are also involved with the design, development, and construction of high tech fiberglass RC sailboats. Other ongoing Mentoring Programs such as social skill building are also an integral part of the youths social development and success in life. Please visit our Projects page and Achieves page for additional information. The plan is to expose inner city kids and youths with special needs to these types of activities while removing them from their environment to form whole relationships, learn from each other, and curb juvenile delinquency and bullying which can be an issue in their social relationships. SAIL USA is funded by the donations of unwanted boats, motor homes, automobiles, campers, and other miscellaneous equipment as well as cash. If you would like to know more about this new program, please call or e-mail. Day trip on Narragansett Bay with Captain Jim.